Winter is slowly closing in here, although we are being blessed with beautiful clear sunny days and bright blue skies, the temperature barely gets above freezing during the day and at night it plummets. Only the truly hardy animals stay around at this time of year. The Gray Squirrel Sciurus carolinensis has its very own fur stole to keep out the chill. Also, being city squirrels they are very well fed and right now are putting on as much weight as possible to get them through the months ahead. There are very few bugs apparent anywhere but I did spot these milkweed bug nymphs Oncopeltus fasciatus, sheltering inside a milkweed pod. All those downy seeds must provide some good insulation. The Mallards Anas platyrhynchos always look singularly unimpressed when the pond starts to freeze up. But there is still some clear water and the Wood Ducks Aix sponsa were making the most of it. The males look resplendant at this time of year. I know Wood Ducks are her favorites and she is missing them right now as her pond has already frozen over. The invasive European House Sparrow Passer domesticus is another tough customer who stays put all the way through winter. Fluffing up its feathers to trap warm air around its body. There are a few food sources still around and I must say, they look very festive. It is harder to find city wildlife at this time of year but there is some! 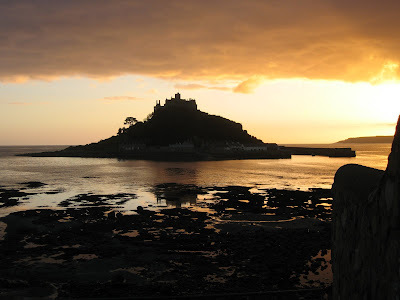 For many wonderful skies from around the world, check out Skywatch Friday. When I wake up in the morning and see a brown layer of pollution where the sky meets the lake it makes me very unhappy. I hate to think of what we are doing to our planet, not to mention our lungs! However the following moon rise photos would not have looked anything like they do without the many particulates that make up city air. For skies around the world check out Skywatch Friday. 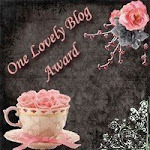 Firstly I want to apologise to everyone who has visited my blog in the last couple of weeks and left comments - I will respond and reciprocate soon, I promise. I am just very behind with everything right now, but I am working on it! As promised last week, we return to the Galapagos and its endless array of avian residents. 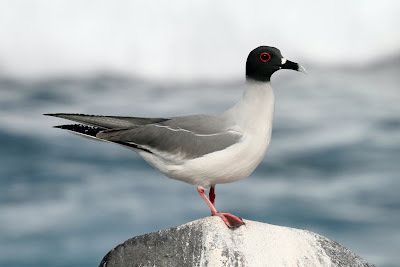 This is the Swallow-tailed Gull Creagrus furcatus. I know what you are thinking - its a Seagull! Yes it is but it is actually a pretty neat one. The Swallow-tailed Gull is the only Gull in the world that hunts at night, it has an exceptionally large eye, sorry it is not easy to see in this shot. When we were traveling on the boat at night between islands, from time to time a ghostly white shape would appear behind the boat, gliding along and it was the Swallow-tailed Gull hunting for squid. It is also thought that this bird uses a primitive form of echo location, similar to that used by bats, to locate its roosting spot on the cliff-side when it returns in the dark. There are so many species that are endemic to these islands, it almost becomes a bit of a joke after a while, the Galapagos Sea lion, the Galapagos Hawk, The Galapagos Tortoise and also this delightful little character - no prizes for guessing - The Galapagos Dove! Zenaida galapagoensis A process of evolution on Genovesa Island has softened the spines of cactus plants and thereby allowed the Galapagos Dove access to pollinate the flowers. This has occurred due to the lack of bees that would normally perform this function. These beautiful little birds are very tame and would fly down very close if you stood still. Their markings are quite stunning, complemented by their bright red legs and feet! I was fortunate enough to watch a pair of them carrying out a whole courtship routine in front of my feet. Lots of picking up of leaves and bits of grass and running round in circles was involved! The Lava Heron Butorides sundevalli was another regular sighting. I was sitting on a rock one morning watching some Marine Iguanas and the Lava Heron flew in so close that I thought he was going to land on me. He landed about six inches in front of me, so close that I couldn't actually get a photo of him. He didn't seem to be the slightest bit bothered by me and just carried on about his heron business. And this is what heron business involves! This is an immature bird and as you can see, high on the menu is crab! 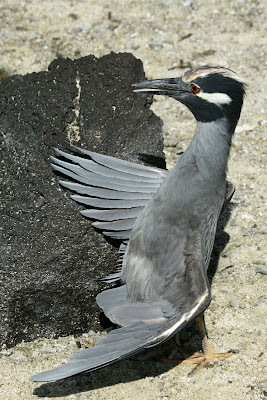 Not to be out done, this Yellow-crowned Night Heron Nycticorax violaceus put on quite the show with his bizarre posing! Again this bird was only a couple of feet away from us. Apparently this pose is a means of lowering the body temperature in the heat of the day. 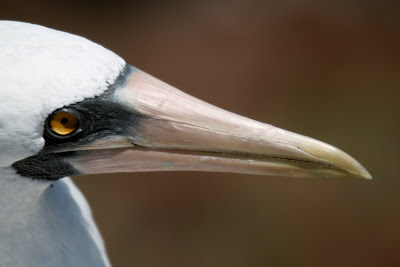 I could not do a bird post without mention of my all time favorite type of bird, the Pelican. 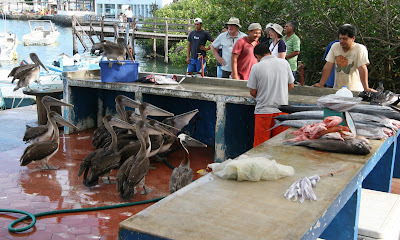 The Brown Pelican Pelecanus occidentalis found on the Galapagos is considered to be an endemic subspecies. We would always have at least one Pelican bobbing around behind our boat whenever we were at anchor. There is one bird that has managed to cash in on the Pelican when it is fishing. The Brown Noddy Anous stolidus waits for the Pelican to begin fishing, as the Pelican surfaces with a beak full of water and fish, the Brown Noddy flies down and lands on the Pelicans head and grabs any small fish that happen to escape from the Pelicans prodigious beak! 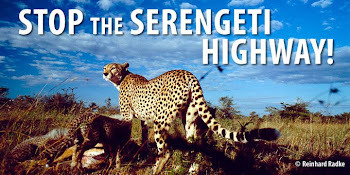 When the guide first told me about this, I thought she was joking until I saw it for myself! Needless to say the Pelican is not too impressed with the process. These birds were hilarious, running around amongst the fish mongers feet like a pack of dogs and if they didn't get the scraps fast enough they would fly up onto the counter where the fish were being gutted and help themselves! I had never seen anything quite like it. Finally I have to mention what is arguably the most famous of all the Galapagos birds, the group that comes under the umbrella of Darwins Finches. There are thirteen species of finch endemic to the islands. As a birder I found it very frustrating because no one, not even the guides can tell them apart so no matter which one it is you see, it is just referred to as a Darwins Finch! It is because of this group of birds that Darwin became captivated by the whole idea of evolution, and the rest, as they say, is history. If you want a really good, modern day perspective on this fascinating subject, I would highly recommend The Beak of the Finch by Jonathan Weiner. To see many more wonderful places around the world check out That's My World. I am very lucky, my husband has clients who live near San Diego, so twice a year we 'have to' travel there so that he can meet with them. They are wonderful people with a beautiful house in the hills. Once a year we stay with them and once a year we splurge and stay in Del Mar. Well, this weekend, which just happens to include my birthday, is our weekend for staying in Del Mar and I must say after a couple of weeks of feeling pretty lousy, there is no better medicine than waking up to blue sky and sunshine, next to the seashore! Both my husband and I grew up next to the Atlantic Ocean, all be it on opposite sides of it, so for us there is no greater treat than to be by the sea. This morning we grabbed our breakfast in a bag and headed down to the sea. I swear there could not have been a more beautiful day. Yes I know! If you live in Southern California it is lovely every day but I think coming from the Midwest that we really do appreciate it! Gradually as more sand appears, various waders start to arrive to feed on invertebrates buried in the sand. I love how they move as one, rather like a shoal of fish. The Willet Catoptrophorus semipalmatus is much more of a solitary figure, using its long beak to dig deeply into the fresh sand. This little immature Black-bellied Plover Pluvialis squatarola (I think!) seemed a little bewildered to find himself alone on the beach, he tried to hang out with the Sanderlings for a while but all their frenzied running back and forth soon became too much for him. There is a belief that everyone is better looking in California, well I am not convinced about the Homo sapiens but it certainly is true when it comes to the gulls! This is the Heermann's Gull Larus heermanni, far more handsome than the Ring-billed Gulls of Chicago or the Herring Gulls of my home town in Cornwall. Well I promised a couple of weeks ago that we would get airborne in the Galapagos for the next post - sorry that got delayed for a week (see previous post) but better late than never! 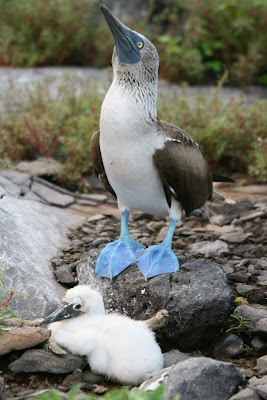 One bird that seems synonymous with the Galapagos is the Blue-footed Booby Sula nebouxii excisa. Blue-footed Boobies can be found in other parts of the world but the sub-species excisa is endemic to Galapagos. 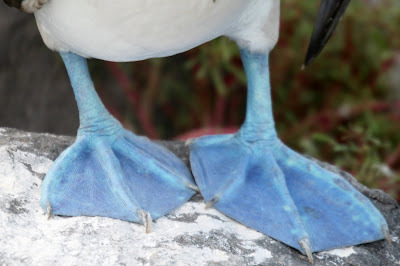 These birds are very much the clowns of the islands and when you see their delightful courtship 'dance' which involves waving their huge, vivid blue feet in the air, you can see why. The Blue-footed Booby fishes close to shore which means that when fishing is good the parents can raise up to three young in their sparse nest spots on the ground. The first time I saw one in this position I was quite alarmed, I thought it was sick or dying! But no, just sleeping! The Red-footed Boobies nest in trees, not on the ground like the other species, they also fish many hundreds of miles out at sea, because of this long commute for food they only ever lay one egg as feeding one chick is a full time task. The third species of Booby found on the islands is the Nazca Booby Sula granti. This spectacular bird is easy to spot because it has beautifully bright white plumage. The Nazca is the largest of the three Booby species, it fishes further from the shore than Blue-footed Boobies but not as far out to sea as the Red-footed Boobies. The Nazca nests on the ground and will always produce two eggs. If they both hatch then the chicks will fight until one is pushed from the nest to die (obligate sibling murder) not an entirely pleasant process but it seems to ensure that each pairing has a high probability of raising a chick with each breeding cycle. Ok, that is enough Boobies for today! I have talked about the Flightless Cormorant Nannopterum harrisi in a previous post but because they are a personal favorite of mine, you have to be subjected again! In case you thought that romance was dead, this bird is living proof that it is actually alive and well. 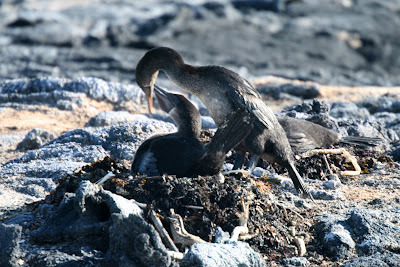 These intriguing birds build their rock and seaweed nests on the rocky shoreline. The female stays on shore to incubate the eggs and later protect the chicks, whilst the male hunts for fish for them. As well as 'bringing home the bacon' on a regular basis, every time he returns to the nest he brings a small gift for his mate, another pebble or piece of seaweed for the nest so as the weeks go by the nest becomes taller and taller! They definitely get my vote for the 'incurable romantic' award! 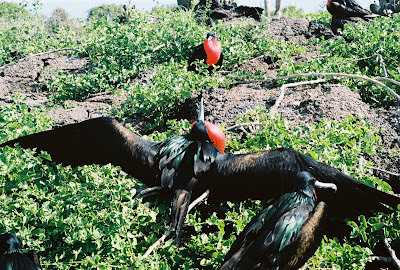 Another bird I have mentioned previously is the Great Frigate bird Fregata minor ridgewayi. Better known for its piratical habits with regard to stealing food from other birds, this bird too can turn on the charm when necessary. The male, equipped with his bizarre scarlet gular pouch waits for females to fly past and then puts on quite the show. First he throws back his head, fills the gular pouch and starts creating a very strange warbling, almost yodeling sound, as this is happening, he shakes his head from side to side and spreads his enormous wings. I guess if you are a female Frigate bird, it works for you! Although most of the females I saw were keeping a fairly wary distance from this extravagant display! The Galapagos Penguin Sphensicus mendiculus is one of the smallest Penguins in the world but what it lacks in physical stature it makes up for in character. This is the only penguin found in the Northern Hemisphere and also the only one to breed entirely within the tropics. How can you not smile when you see these characters? One thing that doing this post is making me realise, is that I can't possible talk about all the amazing birds species in one post, so I guess I know what I will be doing for next weeks post :) Galapagos Birds - Part Two! For many wonderful posts from all over the world, check out Thats My World. In human anatomy, the appendix (or vermiform appendix) is a blind ended tube connected to the caecum, from which it developsembryologically. The caecum is a pouch-like structure of the colon. The term "vermiform" comes from Latin and means "worm-like in appearance".